How do planets get their atmospheres? What would happen to the Earth if the Moon just disappeared? And what’s that strange glow we see after sunset? What would happen if the Moon disappeared — would that change Earth’s orbit? How do planets get atmospheres? I see a faint glow after sunset in the East — what could it be? Can light get stuck in orbit around a black hole? Where on Earth would I weigh the most? How much less would I weigh if the moon was directly overhead? How is ionized hydrogen detected in space? Do we live in an unbalanced Universe? Why do some celestial objects form in disks and others don’t? Could a spacecraft perform a “solar system assist,” in the way we do gravity assists? If Earth had no axial tilt, how eccentric would its orbit have to be to have seasons like we have now? The Cosmic Microwave Background is a redshift of the Big Bang. If one could travel near light speed, would that counteract the redshift? Things would get blueshifted looking ahead, more redshifted looking behind, and looking to the side would look the same. Fraser Cane: Pamela it seems like it’s been so long since we talked. Dr. Pamela Gay: [Laughter] All of about 20 minutes. Fraser: All of about 20 minutes yeah. As I mentioned my computer died, we’re catching up all the episodes using the wife’s computer. We will get the full list of episodes into your hands we promise. This is the next round. This week, how do planets get their atmospheres? What would happen to the Earth if the moon just disappeared? What’s that strange glow that we sometimes see after sunset? Let’s get on with the first question. Samuel Rankert from Fuquay Verena, NC asks: I’ve heard another podcast Skeptics Guide to the Universe, (this is a shout out to them, listen to their podcast) that if the moon vanished the Earth would get along quite nicely. I thought that the moon would change the total amount of the mass in the Earth-Moon-Sun relationship and the Earth would change its orbit. Okay so for starters is there any way that the moon would suddenly vanish? Fraser: Okay, whew! [Laughter] So this is just purely theoretical. Pamela: Our moon is there to stay and if something were able to remove it, it would destroy the Earth in the process probably. It would be bad. Fraser: Some black hole whisking past it would take us out as well. But let’s imagine you that you did whisk away its mass would that affect our relationship with the sun? Pamela: No. In fact how much mass the Earth has doesn’t really have any affect whatsoever on how it orbits the sun. What matters is how fast we’re going. It just happens to be that the two equations the mass of the Earth cancels out and all that matters is the mass of the sun. As long as we keep our velocity, as long as we keep trying to have the same speed at the same place as we go around the sun we’re just going to keep orbiting merrily the way we’re orbiting today. Fraser: This is what Galileo proved, right? Fraser: Dropping objects off of the leaning tower, that it doesn’t matter how much mass it is it always accelerates towards the Earth at the same speed. Pamela: In this case the Earth always accelerates toward the sun at the same speed. Fraser: Right so it doesn’t matter if you replace the Earth with Jupiter, it would still go the same speed. As long as it was going that speed then everything would be fine. Ben Oliver from Brisbane, Australia asks: how do planets get their atmospheres? I guess are there different ways that planets get atmospheres? Pamela: There are two different ways that the gases get into the atmosphere. One is you import your atmosphere. You take a planet, any planet and you clobber it with comets and in the process have the comets release all of their volatiles, their oxygen, their nitrogen, their frozen carbon dioxide. Have them release all of that through melting sublimation processes out into the atmosphere and that’s one way to make an atmosphere. The other way that you can get gases into the atmosphere of a planet is through out-gassing of the planet itself. Planets that are geologically active often have trapped gases beneath their surfaces. These gases can get spit out all different ways. Many of us have seen bubbling steam pots, volcanoes giving off gas, gurgling springs. All of these different things have different methods that often sulfurous nasty smelling gases can escape from the inside of the planet Earth. Fraser: I guess you get a situation like Venus where that stuff just builds up. It’s not going anywhere. It comes out of the Earth and goes up almost like it is floating. Imagine that the Earth is the bottom and it’s letting out it’s like in water right? Gas floats up in water while a rock will go down. It’s like the Earth is separating itself. It’s pushing out the gas but the gas is still being held by the gravity so it can’t go anywhere but it’s floating up on top of the rock. 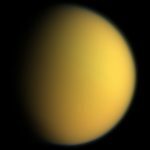 Pamela: This is something that we see with Saturn’s moon Titan. It has an amazingly methane rich atmosphere and we think that a lot of this methane is coming out from internal processes within the moon. We see methane on Mars that we think most likely comes from geological processes. Here on the Earth we have volcanoes that belch and burp all the time. You can get things either externally through comets or you can get things internally through the natural release of gases that are trapped within the surface of the planet. Fraser: Earth is a little bit different because we have organisms that can process stuff out of the atmosphere and even in some cases sequester it away back under the ground. But in most situations sort of once that stuff gets out it is out, right? Fraser: I guess one of the situations is well you have the situation with Mars where it doesn’t have enough of a magnetic field to hold on to the atmosphere against the sun’s solar wind. Pamela: We think that Mars used to have a much richer atmosphere than it has today but various processes from solar winds battering away at the atmosphere to just over time particles collide and getting a little bit too much velocity and flying away on their own. All these different processes have slowly wiped away Mars’ much thicker in the past atmosphere. Fraser: So there you go. Srdevi from India says: there’s a faint glow, it is quite bright in the eastern sky after sunset and it continues through the night. What could be causing it? I think we’re going to assume that we’re not talking about just the sunset because the sun is still there in the sky after the sun sets. Of course, he’s saying this is in the eastern sky. Pamela: Right and that was what actually threw me. When I first looked at this I went aha zodiacal light! Then I went, wait zodiacal light is in the west. Fraser: [Laughter] That’s what I was wondering too. Pamela: Yeah, it’s kind of a sad response but I suspect that if he gets in a car and drives toward the light he’ll find a city. Here we have a really bright glow that’s off in the northeast and it happens to be a large oil refinery that makes a lot of noise and makes a lot of light. You can end up with natural sources of light. For instance if he’d said that instead there was light that was in the west shortly after sunset that would have been zodiacal light. You have sunlight lighting up dust in the plane of the solar system. That scattered sunlight we’re able to see far after the sun has already set. This is actually what Brian May of Queen did some of his dissertation work on. That sadly is on the other side of the sky so I think here we’re just dealing with light pollution. Fraser: Right, the sun rises in the east and sets in the west so you’ll have the light in the west after the sun has set. Usually the east is the dark side so that would have to be light pollution. Martin Szwanveldt7:59 from the Netherlands asks: if light can be captured by a black hole is it also possible the light can get stuck in orbit around a black hole? If so would we be able to detect it? Jason K. asked the same question and we’ve actually already answered this question in the past. If you do have a question for us do a search because we’ve answered a lot of questions now and some of them are starting to double up. Which, we don’t blame you; there are hundreds of shows to listen to. [Laughter] Let’s give the quick answer, can light go into orbit around a black hole? Fraser: Yes – that’s crazy! Pamela: [Laughter] But it’s kind of cool. It’s the fact that light is energy. Energy and mass are the exact same thing and gravity affects both of them. You can end up with photons quite happily orbiting a black hole and we can’t see them because the light is orbiting instead of coming toward us. Fraser: You wouldn’t see the light being emitted from the black hole because it is orbiting a black hole. Where would it be? Would it be outside the event horizon or inside the event horizon? Pamela: When I ran the calculations last time I have to admit I didn’t make any crazy corrections or anything. A straightforward quick calculation has the light actually inside the event horizon. Fraser: So it is doomed anyway but it could be orbiting I guess in sort of mathematically perfectly it could be orbiting at exactly the right spot. It just goes around and around and around. Most likely it’s just going to spiral inward except if it gets bumped or absorbed by other material falling into the black hole. Benjamin Dale from Christchurch, New Zealand – this is the international edition have you noticed that? Pamela: Yeah it’s really cool. We have questions coming in from all over the globe. Fraser: He wants to know: at which point on or near the Earth would I weigh the most and why there? There is a second part of the question which we’ll to in a second. We know that your weight changes where you are. If you’re right in the middle of the Earth you’re weightless but would you weigh more somewhere inside the Earth, right at the surface or up in the air? Pamela: I’m actually going to take the where on the surface of the Earth do you have the largest gravitational pull? This is a straightforward way of looking at this question. There’s some really neat data that came from the GRACE satellite the Gravitational Recovery and Climate Experiment. While it orbited the planet it measured slight variations in the gravitational force. What we found is there are all sorts of different variations in the pull of gravity that are directly related to previously in some cases unknown changes in density beneath the surface of the planet. We find that you weigh more along the north Atlantic mid-Atlantic ridge. You weigh more when you’re in the Himalayas. You weigh less in India than you do in Algeria. There are strong variations as you go all around the planet. From looking at their maps as near as I can tell the place that you would weigh the most is if you were out around Iceland. Fraser: So, there’s something dense underneath Iceland or the way it is positioned on the planet that is the spot where you would weigh the most. What if you lifted up into the air somehow, you’re going to be weighing less because you’re moving away from the gravity. Pamela: This is a what is the gravitational anomaly at the surface of the planet as you travel around question. The gravitational anomaly is the largest positive value when you’re around Iceland. Fraser: Then if you somehow sink into the ground you’re going to weigh less as well because? Pamela: The amount of mass below you is decreased. Fraser: Is decreased and now you’ve got mass above you that is counteracting the pull down below. That’s it. On the surface of the Earth in Iceland you’re going to weigh the most. I’m sure there’s a joke there. [Laughter] Benjamin’s second question then was: how much less would I weigh if the moon was directly above me with its gravity pulling me up? Pamela: Here the catch is, in general remember the moon is not straight overhead unless you’re on just the right part of the planet. The moon is generally somewhere in the sky above you but it may be off at some crazy angle relative to you in the center of the planet. So if you managed to be on the line where the center of the Earth is directly below your feet and the center of the mass of the moon was directly over your head, in that one very most powerful deviation situation your weight would change by about three parts in a million. This really isn’t something that will help you discount the amount of candy that you’ve been eating recently or anything like that. Fraser: Yet that force of gravity is what affects the tides and causes the Earth to lift up and down by a meter. It’s amazing. Pamela: It’s a meaningful affect. The tidal force is where you start looking at the combined changes to the gravitational fields. In general in terms of just the variation that you’re going to see on your bathroom scale, you actually get more variation when you take into account the change in how much you weigh on that spring scale when you’re at the equator of the planet versus the north pole of the planet due to the rotation. You get more of a lift off of being spun than you do from having the moon straight overhead. Fraser: That’s right you weigh less on the equator than you do on the north pole. Pamela: That’s just because well as XKCD points out centripetal force really is not completely imaginary. Nor is centrifugal or so just pick your set of names, run your equations. It does affect how much you weigh. Fraser: Alright. Matthew Maddox asks: how could one detect ionized hydrogen in space? It seems that hydrogen has no electrons to change energy states and give off light so it would be very difficult to detect. Now, ionized hydrogen – what is that? Pamela: Ionized hydrogen is where that one lone sad electron that is trying very hard to orbit its helium nuclei which are generally just a single proton. Ionized hydrogen is where that last lonely electron is given enough energy that it flies off into space and is no longer attached to the hydrogen. Fraser: The hydrogen is now just a bare proton? Fraser: With no electron orbiting it? Fraser: Then the electron is off and away? Fraser: How can we detect that then? Pamela: We can only detect it when the electron decides it’s going to reattach itself to the hydrogen atom and release a photon in the process. Fraser: We only detect when the electrons connect to the protons again? Pamela: Right and other than that, no if you get a hot enough gas we can’t see the hydrogen because there is no transition taking place. Fraser: Why is it important to find ionized hydrogen? Pamela: It’s one of the most common things in space and it’s always nice to know where the hot spots are. When you have star forming regions, when you have bubbles around hot stars this is where you start to get the hydrogen gas. It’s a temperature indicator. You start looking at where are all the transitions of all the different atoms that you can see in that region. By comparing this number of hydrogen transitions you see this number of silicon transitions. By looking at all the different transitions of all the different levels you can start to figure out the exact temperature of the gas. Fraser: That’s different from the cold molecular hydrogen which is the stuff that stars are made from. Fraser: There you go. Stephen DeSousa asks: is it possible that while we see an unbalanced universe of matter traveling forward in time is in fact balanced by anti-matter traveling backwards in time? Whoa. [Laughter] Do we live in an unbalanced universe of matter traveling forward in time? What does unbalanced mean? Pamela: I think what he’s referring to is for reasons that we can’t fully explain when the universe formed for every roughly one billion particles of antimatter there was one billion and one particle of regular matter. The billion versus the billion annihilated on one another it released a lot of energy and left behind that extra one piece of regular matter. We’re not entirely sure why the universe would have formed with this slight asymmetry in the in the amount of matter and antimatter. This is something that theorists are working very hard to try and figure out. They’re not quite there yet. I think what he is referring to is that slight asymmetry. There are a couple of problems with what he is talking about. One is that by definition time started at the moment of the big bang and time only moves forward. The other is that antimatter has all the same basic properties in terms of how it interacts with things like gravity that regular matter has. There’s no reason to think that the two of them would have had any reason to be going in opposite directions in time. Fraser: I guess what Stephen is imagining is some situation where you get that balancing in at the same time as you’ve got that one left over piece of matter moving forward. You also for some weird reason had an alternate near universe where you had one extra antimatter. I guess what you’re saying I think is that matter and antimatter are both happy to move forward in time. Pamela: Right and they both interact with things like gravity just the same so they’re not going to preferentially segregate or act differently. It’s just that when they touch they tend to annihilate one another. Fraser: The fact that we can form antimatter now in supercolliders and so on that we have the antimatter here in our universe with us. It’s not like it just disappears every time you make some antimatter it just vaporizes and off it goes into its backwards journey through time. Okay thanks for the question. Tim Vickey from Washington, DC asks: why do some celestial objects form into discs and others don’t? Are there solar systems that aren’t in a disc shape like our own? Or galaxies? Do planets usually form in a disc shape with their moons? What about local clusters? Why all these discs? Pamela: In general it’s this terrible thing called angular momentum. Unless two objects manage to hit such that their velocities and their centers of masses are exactly aligned, you’re going to end up with some sort of rotation. Anytime you have something rotating it naturally forms into a disc. Anyone who has ever tried to make pizza by throwing a blob of dough into the air and giving it a bit of rotation knows this. Take any round thing and rotate it fast enough and it’s going to become oblate, become more oblate and eventually form a disc. Even our sun and Jupiter because of their rotation aren’t perfect spheres. Fraser: Well even the Earth. Fraser: Yeah the Earth is I think it is like 20 kilometers or 15 kilometers around the equator is about that further from the center of the Earth than the poles. Pamela: You can end up with things forming a spheroid due to collisions. For instance the oort cloud we think is a spheroid of chunks of ice that orbit around the entirety of the solar system. We have random rogue comets and asteroids that due to past gravitational interactions and collisions and other off-centered flinging processes they ended up forming a spheroid. They ended up forming non-disc motions. Fraser: You get like giant elliptical galaxies where you have – even this will happen with the Milky Way and Andromeda – when our two galaxies collide. You’re going to get this sort of ball-shaped, egg-shaped galaxy which is the mixture of the velocities of the stars. Pamela: What’s happening here is you take two discs, collide them violently and all of the different angular momentums end up randomizing. You can end up with a spheroidal result. If you have just two things colliding or two blobs of gas and dust colliding you can generally form a nice friendly disc. Once you get two discs of sufficient enough mass and what’s kind of cool is out of the Sloan Digital Sky Survey they’re finding that there seems to be this distinctive mass where any collision above this particular combined mass results in an elliptical galaxy. Solar systems are small. They form basically out of a single blob of gas and dust getting knocked somehow and collapsing down and spinning up. It’s through that spinning process that you end up with solar systems having all of their planets generally in one nice simple disc. Fraser: Do galaxy clusters form into discs as well? Pamela: So far we haven’t seen any that are truly discs. You have some galaxy clusters that are flatter than others but with the galaxy clusters forming you have objects falling in from all different directions. It’s from that falling in from all different directions that you end up with we say a relaxed spheroidal system if you just wait long enough. Fraser: Right. Lee Anthony from Manhattan, NY asks: since we do gravity assists with spaceships all the time around other planets is it possible to do some kind of solar system assisted speed boost by going around the sun as it rotates around the Milky Way? I guess we would launch a spacecraft from Earth and it would somehow use the momentum of the sun going around the Milky Way to get a boost. Is that possible? Pamela: Not easily if you start out on the Earth. If you imagine instead that you have some extraterrestrial spacecraft capable of moving at the types of speeds that are comparable to the sun’s speed relative to the center of mass of the galaxy, if you’re capable of starting off with one of these huge velocities then you can use the sun to either accelerate yourself or slow yourself down depending on what direction you’re going relative to the center of the Milky Way. But within our own solar system you’re starting off with velocities that are more planet-like and the sun within that particular frame of reference really isn’t moving. You have to move so that your motion is more in the same frame as the sun relative to the Milky Way versus spacecraft moving relative to the planets. Fraser: So you’ve already got the boost because you’re here with the sun going around the Milky Way that’s it. You’re enjoying that velocity and you have to go to some other place that’s moving at a faster speed than the Milky Way that you can then absorb some of its velocity. Fraser: This is that same situation with the thought experiment with how the gravity system works here in the solar system. You launch from the Earth, you fire your rocket towards Jupiter. As you move towards Jupiter you get pulled into by its gravity well. Then you have to sort of climb back out of it again as you’re moving past Jupiter. The point is that Jupiter has also pulled you up to its speed in its orbit. In fact you as a spacecraft have slowed Jupiter down in its orbit, but not very much. Pamela: Right, it is such a small amount. Fraser: You’re losing the speed that you got on the inbound trip when you made the up bound trip. The thing you get to keep is you get to keep its orbital velocity around the sun. Pamela: So, not quite. We’re sorry. You’re already moving at the same pace as the sun and your really have to have a significantly different velocity before you’re able to take advantage of the boost. Fraser: Then you’re set. Robert Wilson from Brisbane, Australia asks: if the Earth had no axial tilt how eccentric would the orbit have to be to produce seasons equivalent to our axial induced ones? Okay let’s unpack this one. The Earth’s seasons are caused by the tilt of the axis? In the northern hemisphere the summer is in June-July when the pole is tilted towards the sun. Winter happens when the northern hemisphere is tilted away from the sun and that’s reversed in the southern hemisphere. Pamela: The seasons are basically caused by how tightly packed the rays of light are when they hit planet Earth. You can sort of play with this with a flashlight. If you beam the flashlight straight down on the table and make a little tiny circle of light because you’re pointed straight down, that circle of light will get warmer faster than if you tilt the flashlight at the surface of the desk and make this really long much fainter pattern of light. That is going to be a much cooler surface. Fraser: The same numbers of photons are hitting the surface they’re just stretched out over a larger surface area. Pamela: So it has nothing to do with the distance from the sun. It has everything to do with the angle at which the sunlight is hitting the planet Earth. Fraser: But the distance to the sun has to have some effect. Pamela: The thing is the Earth’s orbit is mostly a circle. It has slight deviations but it turns out we’re actually closest to the sun during January. Here in the northern hemisphere we enjoy a slightly, slightly milder winter than you get down in the southern hemisphere but the effects are very small. You can ski in both hemispheres. We have glaciers in both hemispheres. It is as the orbit gets more and more elliptical that you start to see significant variations from hemisphere to hemisphere. Fraser: Let’s sort of do that thought experiment then. If the Earth had a much more elliptical orbit what would we see? Pamela: It gets complicated because of with Kepler’s laws of orbital motion you’re tracing out what we call equal areas and equal time. This means that when you’re up close to the sun on a highly elliptical orbit you’re going to be whipping around the sun very quickly so that in one say hundred hour period the triangle that is formed by where you started, where you ended and where the sun is, is going to have the exact same area as the triangle that is formed when you’re far, far away from the sun moving much slower and you travel for that same hundred day period. When you’re far away from the sun you’re going to orbit very, very slowly. As you orbit slowly your planet has a chance to radiate away all of the heat that it gathered up during the summer. You have to start taking into consideration now remove all axial tilt and have seasons that are caused strictly by the distance from the sun. Change everything. In this case you’re forcing your winters to be longer which is going to allow them to have the oceans cool more, have everything cool more, lose more of the heat that you stored up during summer and it radically changes the way the seasons work. You can’t easily do a one for one correlation. You also have to start worrying about how well the atmosphere insulates the planet. A planet that has a thick atmosphere is going to have one set of effects than a planet that has a thinner atmosphere. Fraser: It’s almost like winter is caused by the orbital eccentricity are just completely or very different and much harsher when you have an elliptical orbit. I can kind of imagine in my mind a comet going around the sun in a very eccentric orbit. It kind of whips around the sun and then slows down as it goes out into the great big orbit. Then it whips around the sun and then goes back out again. That’s the situation. You’d have a summer that was a few days long [laughter] and then you’d have this winter that went on and on. I guess it’s almost impossible to calculate, right? Pamela: It becomes a problem for atmospheric physicists or geophysicists. That’s not me but I can say I’m much happier having seasons that are due to the axial tilt of a planet that has a mostly circular orbit. We have nice symmetric seasons. This is also one thing to think about is the reason that August is so much hotter than June which is when we actually are getting the most light from the sun. The sun keeps shining on us and we retain that heat and the rocks heat up and the oceans heat up. The coldest part of the winter lands in February. The hottest part of the summer lands in August for us in the northern hemisphere. This is all because of the lag in the thermal cycle. Fraser: Right it’s too complicated to calculate or I guess for this show. But I guess if there are any geologists or climatologists who want to have a shot at it we’d love to hear your calculations. Pamela: Or send us a reference to the journal articles. Fraser: Right or give us some time on the super computer that you’ve used to run your calculation. It’s a great thought experiment to think about how it is different. Sorry we couldn’t answer it Robert but we want to at least cover it. Ryan Flores asks: does light have mass? Fraser: Moving on. [Laughter] Really, no mass? Pamela: Yeah. Light has no mass. It does have energy which means gravity affects it. Fraser: Right, light has energy and therefore gravity can pull on energy. Pamela: Yes, energy and mass are just different forms of the exact same stuff. Fraser: We’ve done a bunch of shows on this. If I take a bunch of energy turn it into matter, it will experience the same amount of gravity either way. Fraser: Thanks Einstein. [Laughter] Brad Goodspeed from Toronto, Canada asks: I understand that the cosmic microwave background radiation is the red shifted remains of a much higher energy emission, that being the big bang. The expansion of the universe and the Doppler effects simply appears to make it into looking into longer wavelengths to us because of our very low relative speed. Does that mean that if one could travel near the speed of light the entirety of space would begin to get pushed back into visible light thence the opposite affect? Okay, so cosmic microwave background radiation is the afterglow of the big bang that has been because of its velocity moving away from us. It has been red shifted from the visible light it was when it was created to the microwave that we see today. I guess that’s the first part of it. If you we were moving towards I guess moving at close to light speed would the microwave background radiation shift back into another spectrum? Pamela: Yes but it would shift differently depending upon what direction we’re looking. Let’s say that we’re moving straight north. In that straight north direction we’d see everything eventually as we move faster and faster popped back into the visible light. At the same time if we were to look straight south looking behind us we’d see that that light would have disappeared out of the microwave and gone further and further into the radio. Then if we looked perpendicular to the direction of our motion, if we looked left, right and east and west what we’d find is that light didn’t change color at all. The Doppler Effect only affects things along the direction of our motion. In fact we see that right now when we look out at the cosmic microwave background. We can measure our relative velocity against the cosmic microwave background and figure out how fast are we moving relative to the center of the Milky Way. How fast is the Milky Way itself moving relative to the cosmic microwave background? It sort of provides us a last ditch way of measuring our own motion through the cosmos. Fraser: It’s almost like a universal sort of landmark. Pamela: We’re not supposed to say that there’s any one default frame of reference. That’s one of those things that you learn from Einstein. It does provide us a final check on here’s one frame of reference that we can use to measure ourselves against. Fraser: Right so if you think you’re moving a certain speed in this direction you can check it against what you see with the cosmic microwave background. Then I’m just trying to imagine what I would see. I’m on my spaceship, I look ahead and things would get bright. Pamela: Things would get blue. Fraser: Things would get blue and I would look behind and things would get redder. I would look out the sides and everything would look the same. Fraser: Wow, and then how far would they go? The faster and faster I go things would just get bluer and bluer in front of me in other words shifting back towards visible back eventually what they would just turn into gamma rays? Pamela: If you’re moving fast enough. Fraser: The stuff that’s going behind me even though there’s gamma rays coming at me they could turn into radio waves. Fraser: That’s cool. J. P. L from Heartland, Michigan asks: is repulsive gravity real? Fraser: But isn’t it no but maybe? Pamela: Here’s the thing. Gravity itself means one very specific thing. It is the force between two objects of mass where energy and mass are the same thing that pulled two objects together. That’s gravity. When we start talking about dark energy, it is some sort of a repulsive force that is pushing the universe apart. There are ways of looking at the equations that have it as a force. There are ways that have you looking at the equations as this is some sort of an extra energy that is exerting pressure but it’s a different thing. You have gravity which is always, always an I’m going to pull two things together force. Then you have dark energy that this mysterious something or other that is causing the universe to push itself apart. That’s not repulsive gravity. It is something different. A lot of people popularize it as saying oh it’s repulsive gravity. No that’s just sort of like saying that kangaroos are a different form of mouse. No, they’re not genetically similar to mouse at all. I don’t know why someone would say that but it is equally ludicrous. Dark energy is something completely different. It is a completely different force. Gravity is a very specific mathematical G * m1 * m2 over r2 – always attractive. Fraser: Right. That’s it for the questions this week Pamela. ie. a really small but not zero number! No, not quite. E=mc^2 as you say, but that doesn’t mean that all energy is also mass. In this case it just means that if you converted the energy E of a photon into mass, that is how much mass you would get. 1. A photon will orbit a black hole at the photon sphere which is 1.5 Rs (the event horizon). 2. Light has relativistic mass, but no rest mass. It has momentum. 3. Good choice of Iceland for high gravity: It is both close to the pole and sits on a pocket of high mass. Not only does gravity vary be local mass in the earth’s crust, it also varies by how far you are from the earth’s center. Therefore, even though the Himalayas have more gravity (mass) as measured by a satellite in a fixed orbit, on the surface, they would measure less gravity because they are farther from the earth’s center. Likewise, because the earth has a smaller radius at the poles (and no centripetal forces caused by the earth’s rotation) the preceived gravity will be higher there. But, as you dig down through the mantel, gravity increase for awhile. This is because the mantel is less dense than earth’s iron core (My memory is that it gets a little above 10 m/s^2). It than starts to decrease reaching zero at the center. repulsive gravity is referred to severel times. At 31 minutes it gets mentioned twice by Krauss. I am really confused now after Pamela’s “nope” answer! If the glow remained in the same spot with respect to the horizon then I’d have to agree with Pamela that the most likely cause is light pollution. If however the glow appeared to rise in the East as the sun sank lower below the Western horizon, a possible explanation would the the Gegenschein. Like the Zodiacal Light, this is light reflected off of interplanetary dust in the plane of the ecliptic. In the case of the Gegenschein, it appears at the antisolar point, ie it would appear in the East as the sun sets in the West. See http://en.wikipedia.org/wiki/Gegenschein for more details. If this is the true explanantion then I envy the darkness of the listener’s night sky that allows them to see this phenomena !! You guys totally forgot about noctilucent clouds as a source of light after sunset. At one point in the show you talked about how ionized hydrogen, which contains just a proton wouldn’t be visible because there were no electrons to excite. First, wouldn’t ionized hydrogen gas have a mixture of different isotopes and therefore have some (small) quantities of deuterium and tritium? Wouldn’t these isotopes occasionally decay and provide visible effects? You say ‘no effect if moon disappears’ … but don’t the Earth and Moon orbit a common center of mass that orbits the Sun? If the Moon went away the earth would shift its center of mass to the place that center of mass used to be … not a big change but probably somewhat violent!!! Should have added to my post that there is the Gegenschein, or Opposition light. It is similar to the zodiac lights. It is directy opposite the sun in the sky and is the perpendicular reflection of the sun off of dust along the plane of the solar system. It could and would provide a faint glow in the east immediately after sunset. Concerning the question about the CMB radiation redshifting and blueshifting as one approaches the speed of light, did you forget about the relativistic *transverse* doppler effect?